News of NHS financial woes is an almost daily occurrence. Either the government is blaming external influences for their deficit, or the opposition is blaming the government for financial mismanagement. One of the areas highlighted as a growing cause of concern for the NHS is the amount of money spent on medical negligence claims. Understandably, the government sees this as an area which needs to improve. However, instead of looking internally at their policies and procedures which cause harm, they blame victims for having the nerve to seek retribution for injuries they should never have suffered. No matter what the Minister for Health would like you to believe, the aim of a medical negligence solicitor is not to bleed the NHS dry. Rather, our job is to represent victims who have had their lives turned upside down – in many instances permanently – because a medical professional they trusted made a mistake that they should not have. We obtain legal and financial recognition for unfair and harmful medical care so victims can move forward with their lives without being held back by their injuries. How Much Compensation for Medical Negligence? One of the first questions people want to be answered is “how much could my medical claim be worth?” While it is not always an easy question to answer, it is vital to ask as you need to know whether making a claim is the right action for you. As hard as your medical negligence lawyer will work to limit the impact an ongoing claim has on your life, the process of claiming compensation can be intrusive, particularly if your injury is serious and ongoing. Before they can tell you how much compensation to expect, your solicitor will need to gather evidence to prove the nature of negligence, and the impact your injury has had on your life. Compensation payments are divided into two parts, each being calculated separately. General damages look at the physical implication of your injury, and the pain and suffering you have endured. There are industry guidelines that solicitors and judges use to work out medical negligence compensation amounts for different types of injuries. These figures are updated annually by the Judicial Studies Board (JSB) based on the most recent claims and payments, and published in the JSB Guidelines for the Assessment of General Damages in Personal Injury Cases. As a general rule, the more severe your injury and the worse the long-term implications it has on your health, the more compensation you will receive. Special damages are to compensate you for any financial harm done to you as the result of an injury caused by medical negligence. In their most basic form, special damages can be used to reimburse the cost of reasonable private medical treatment. For example, if you have needed to see a physiotherapist or plastic surgeon, or had to have a nurse come to your house to change your dressings while you were recovering. Your medical negligence solicitor can also claim special damages if your earnings have been affected either in the short term if there is a shortfall between statutory sick pay and your normal salary, or if you have to reduce your working hours or even change your career completely due to your injury. An example of this is a woman in her 60s who worked in catering and was forced into early retirement as a botched operation on her knee. The surgeon’s negligence left her unable to stand for extended periods without suffering significant pain, which made working in her current field impossible. She successfully sued for compensation to cover not only her lost earnings, but also the shortfall in her pension because her early retirement meant she was unable to make several years of contributions. Every compensation claim is treated on an individual basis to ensure each victim receives appropriate payment for their circumstances. Joint replacement surgery is a common medical procedure in the UK. Figures from The National Joint Registry for England, Wales, Northern Ireland and the Isle of Man (NJR) show that from April 2003 until December 2016, more than 860,000 hip replacement operations were carried out in the UK. Of these, over 24,000 needed a second operation directly because of the primary operation, while 3,500 required more than one secondary operation. Combine those numbers, and it shows an average of more than 2,100 hip replacement operations in the UK every year. As with all types of medical negligence claims, hip replacement compensation amounts depends on the nature and effect of an injury, and you should seek legal advice for an accurate estimate of what is a reasonable award for you. Severe injuries with lasting significant effect which result in hip deformity and affect a victim’s ability to walk unaided or have a vaginal birth can receive an award of between £51,500 to £86,000. Moderate injuries where there is no lasting damage, and there is a very low risk that it may cause future issues to a patient’s health or mobility, are typically recognised with payments of between £17,500 to £25,750. Temporarily severe injuries, such as negligent hip replacement surgery, can warrant between £8,250 and £17,500. Lesser injuries which cause no residual pain or disability can receive awards of between £2,600 and £8,250. These figures show that the bands are very broad to be able to accommodate the extreme variations between one victim’s injury and another. These payments are only for general damages and do not address any financial (or special) damages incurred by a victim. What is Hip Replacement Negligence? When done correctly, hip replacement surgery is a straightforward process that takes between an hour and 90-minutes. Most replacement hip joints use a metal ball in a plastic socket, although ceramic is frequently used for the ball and socket in younger patients as it lasts longer than plastic. The new joint pieces are cemented to the healthy bone with a type of acrylic glue. In some instances, no glue is used. Instead, the surface of the replacement joint is roughened and placed in a way that encourages the bone to grow and attach itself to the new part. Hip replacement negligence can take several forms. Surgical errors, including poor post-surgery care that leads to infection or blood clots. Using the wrong material or size for the replacement joint. Incorrect placement of the socket or ball. A typical example of hip replacement negligence relates to a man in his 70s whose replacement hip joint was put in at the wrong angle, causing pain which lasted longer than the expected recovery time. His consultant advised it was normal for patients to experience such discomfort for up to two years. After two years, the pain was still present, and he again sought medical advice. An x-ray showed that the rubbing of incorrectly placed hip had caused further deterioration of his natural hip. A full hip-replacement was needed to fix the issue, alleviate the pain and restore normal mobility. Not all subsequent treatment related to a hip-replacement is due to negligence. However, when an injury could have been avoided if someone had been more diligent, adequate quality control procedures had been in place, or a medical professional had simply not made a mistake, then you may be entitled to claim compensation for your injury. Maternity negligence compensation payments account for over a quarter of compensation paid by the NHS since 2012. This is due in part because these claims can take years to resolve as the extent and impact of damage are not always obvious until a child develops. For example, one of the most frequent conditions resulting from medical negligence is cerebral palsy, the signs of which can go unnoticed until a child misses expected development milestones between their third and fifth birthdays. Given that it can take so long for the extent of maternity injuries to be identified and assessed, it makes sense that this type of claim can take the longest to resolve and typically go to court so a judge can decide on appropriate compensation. Injuries that are noticed quickly and can be treated without leaving lasting health issues are typically faster to resolve and are frequently resolved without having to go to court. It will benefit you significantly to instruct a medical negligence solicitor with proven success in handling claims similar to yours, as their specialist experience and negotiation skills will help ensure you receive maximum compensation in the shortest possible time. To give your compensation claim the best chance of success, get advice from an expert medical negligence solicitor as soon as you suspect your injury was due to negligence and could have been avoided. There is a time limit to begin a claim (three years either from the date of the injury or the date the injury was linked to negligence) but it is always easier to evidence a fault when the investigation is conducted as soon as possible after the event. As the claimant, the duty to prove negligence is yours and the sooner you have an experienced legal team asking relevant questions and collecting evidence, the more positive the outcome is likely to be. If there is doubt about the influence negligence had on your injury, then you may not receive the maximum compensation to which you are entitled. The average compensation claim for medical negligence takes between 15 and 18 months to resolve, so start today by arranging for a free, no obligation discussion with a medical negligence expert about your circumstances. The first step in a successful compensation claim for medical negligence is to contact a specialist solicitor to determine whether you have the legal right to request it. They will help to ascertain whether negligence was the cause of a contributing factor in your injury. Evidence will be gathered not only to prove negligence caused your injury but also to show the impact this has had on your life both physically and financially. Your solicitor will notify the other party of your intention to request payment of compensation so they can conduct their own research. 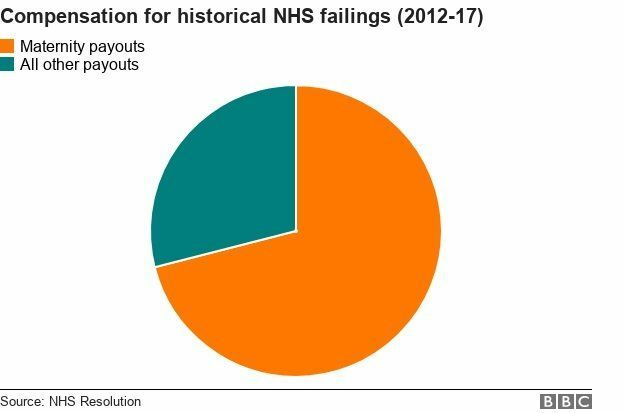 In the case of compensation claims against the NHS, all requests are handled by the NHS Litigation Authority, who claims to resolve around 98% of all claims without the need for litigation and court. Your solicitor will negotiate with the lawyers representing the other party to reach an agreement on a fair and appropriate amount of compensation. If the other party denies liability or refuses to compensate you appropriately, your solicitor may recommend you submit your claim to a court where a judge will review the evidence from both sides and make a legally binding ruling. When you accept an offer of compensation, you also agree that you cannot seek further compensation if, in future, it becomes apparent that the impact of your injury was worse than believed or you were entitled to receive more money. It is, therefore, imperative that you always talk to a medical negligence solicitor before you accept any offer of compensation, especially if it was made directly to you and not through your lawyer. As with the amount of compensation you receive, the amount of tax you may have to pay also depends on individual circumstances. Start your successful compensation claim for medical negligence today by talking to The Medical Negligence Experts. They can arrange for you to have a free consultation with a legal advisor who can answer your initial queries and give you the information you need to decide how to proceed. The majority of claims The Medical Negligence Experts handle are done on a No Win No Fee* basis, so get in touch and find out more. We assess all claims on a No Win No Fee basis, then we can determine how successful a claim is likely to be.